The family of Sister Brittany Samuelson wait for the profession ceremony to begin. 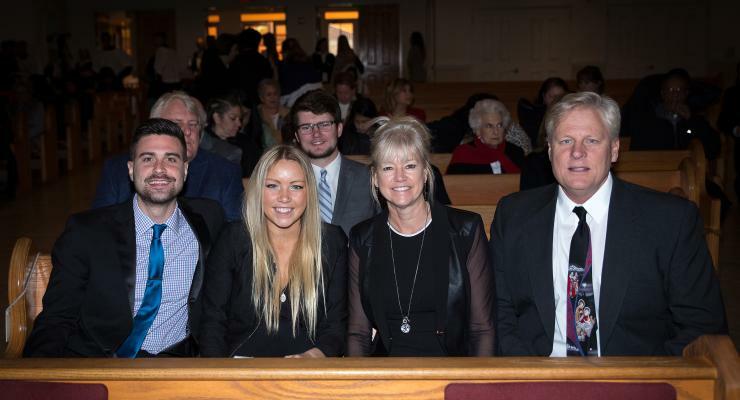 From right: Frank and Laura Samuelson, her parents, Ashley, her sister, and Ellio, her brother-in-law. 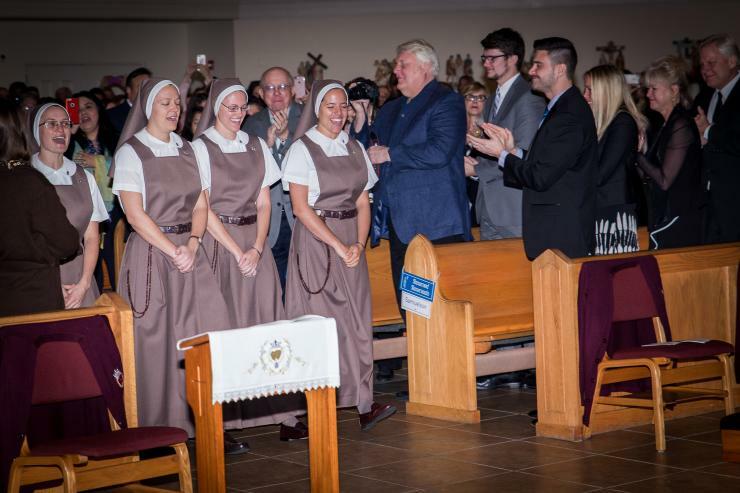 Those making their first vows enter Our Lady of Lourdes Church at the start of the ceremony: from left, rear: Sister Clare Marie Bailey, Sister Mary Rachel Hart, Sister Brittany Rose Samuelson, and Sister Alexia Maria Zaldivar-Boillat. Sister Mary Rachel Hart smiles as Sister Ana Margarita Lanzas, the community's vicar, signs the Formula of Profession, as Mother Adela Galindo, superior and foundress, looks on. The cross of the Pierced Hearts, which will be presented to the four newly professed sisters, awaits Archbishop Thomas Wenski's blessing. Sister Clare Marie Bailey receives the full religious habit as a sign of her consecration to Christ. All the other sisters will do the same and leave the church to be dressed in their habit. The assembly welcomes back the new sisters, now wearing their religious habit. 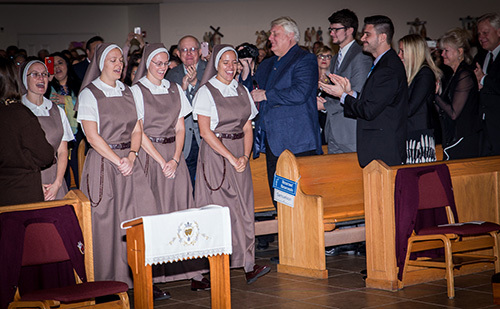 From left: Sister Clare Marie Bailey, Sister Mary Rachel Hart, Sister Brittany Rose Samuelson, and Sister Alexia Maria Zaldivar-Boillat. The newly professed sisters pose with their superior, Mother Adela Galindo, center, foundress of the Servants of the Pierced Hearts of Jesus and Mary, after the ceremony. 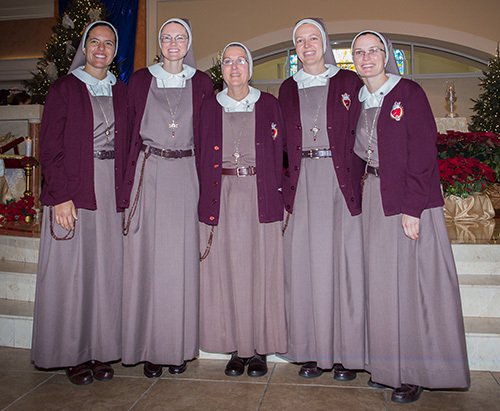 From left: Sister Alexia Maria Zaldivar-Boillat, Sister Brittany Rose Samuelson, Sister Mary Rachel Hart, and Sister Clare Marie Bailey. The entire community of Servants of the Pierced Hearts, including the newly professed sisters, pose with Archbishop Thomas Wenski after the ceremony. MIAMI | Growing up in Naperville, Ill., Brittany Samuelson set an example in high school through leadership in the nondenominational Christian Young Life program. Then, at the Catholic Center at Illinois State University, she encountered inspiring Servants of the Pierced Hearts of Jesus and Mary — not having realized that women religious still existed. In college, she majored in middle school education while serving in Catholic outreach and mentoring at-risk youth. She later taught for two years at a Catholic school. But feeling called herself to deeper waters, she sold all her possessions and headed south to Miami — seeking not sand and sunlight but freedom in Christ. After over two years of formation, she and three other young women professed their first vows as Servants of the Pierced Hearts Jan. 6, at a Mass celebrated by Archbishop Thomas Wenski. Over 1,000 friends and family filled Our Lady of Lourdes Church in Miami for the ceremony. The others making first vows as Servants of the Pierced Hearts were Alexia Zaldivar-Boillat of Houston, Texas, Clare Bailey from Bourbonnais, Ill., and Mary Hart of Clearwater, Fla. Sister Alexia will serve in the house of formation in Miami, Sister Brittany at the University of North Florida in Jacksonville, and Sister Mary and Sister Clare in campus ministries in Illinois. Testifying to the order’s vitality, more than 50 professed Pierced Hearts joined them for the liturgy in their cocoa brown habits, veils, cushioned shoes and crucifix necklaces. 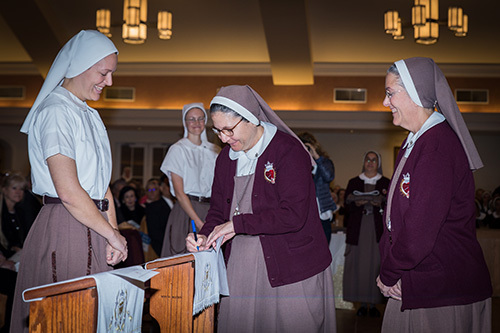 Sister Mary Rachel Hart smiles as Sister Ana Margarita Lanzas, the community's vicar, signs the Formula of Profession, and Mother Adela Galindo, superior and foundress, looks on. As the population of women religious has plummeted nationwide from 180,000 in 1965 to 50,000 in 2014, the order founded in Miami in 1990 has grown to 54 women in convents here, in St. Augustine and Orlando, as well as in the Diocese of Peoria, Ill., Rome, Italy, and Minas, Uruguay. Over 25 serve the Archdiocese of Miami in positions including director of religious education, chaplain, and executive assistant to the archbishop. 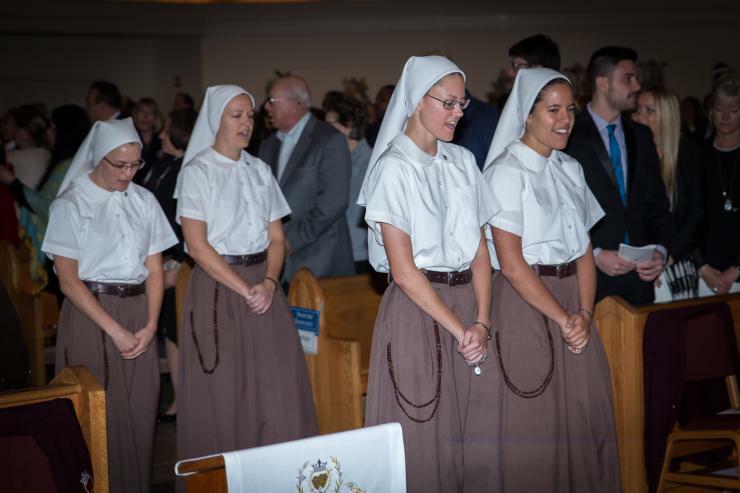 The assembly welcomes back the new sisters, now wearing their religious habit. 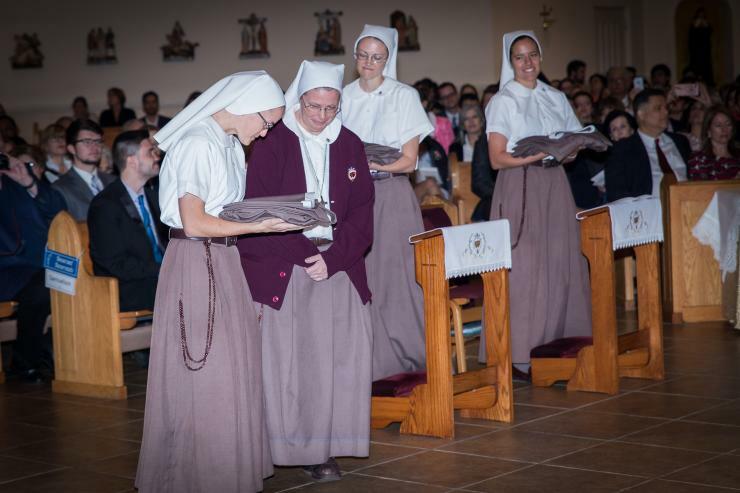 From left: Sister Clare Marie Bailey, Sister Mary Rachel Hart, Sister Brittany Rose Samuelson, and Sister Alexia Maria Zaldivar-Boillat. 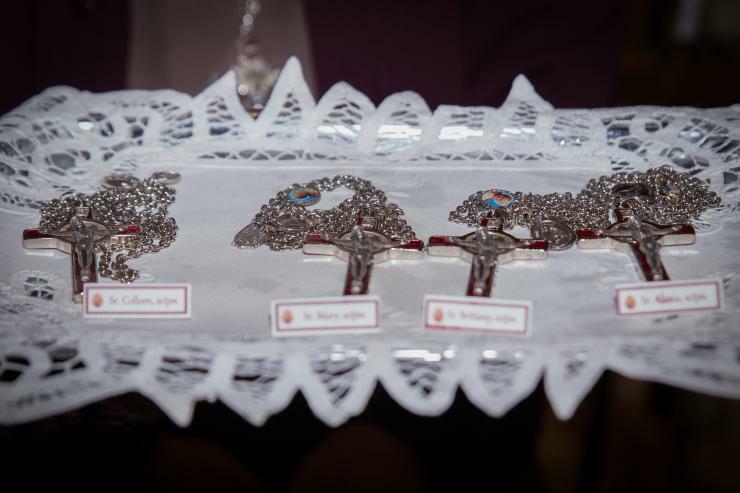 The women were presented with their order’s habit and crucifix and left the worship space to vest as the congregation sang “Un Viaje Largo” (A Long Journey). As they reentered, congregants broke into enthusiastic applause. “I began to grow in my relationship with the Lord and to ask him what is his perfect plan for my life. And I felt from my heart he told me you are mine,” said Sister Alexia, whose family emigrated from El Salvador. Her father, Julio Zaldivar, believes her example can encourage other youths in holiness. “It’s not usual for young people to actually embrace vows of poverty, chastity and total Marian availability in these days. And to have someone give her life without interest to love and serve the people, that’s a big light in this world,” he said. The newly professed sisters pose with their superior, Mother Adela Galindo, center, foundress of the Servants of the Pierced Hearts of Jesus and Mary, after the ceremony. 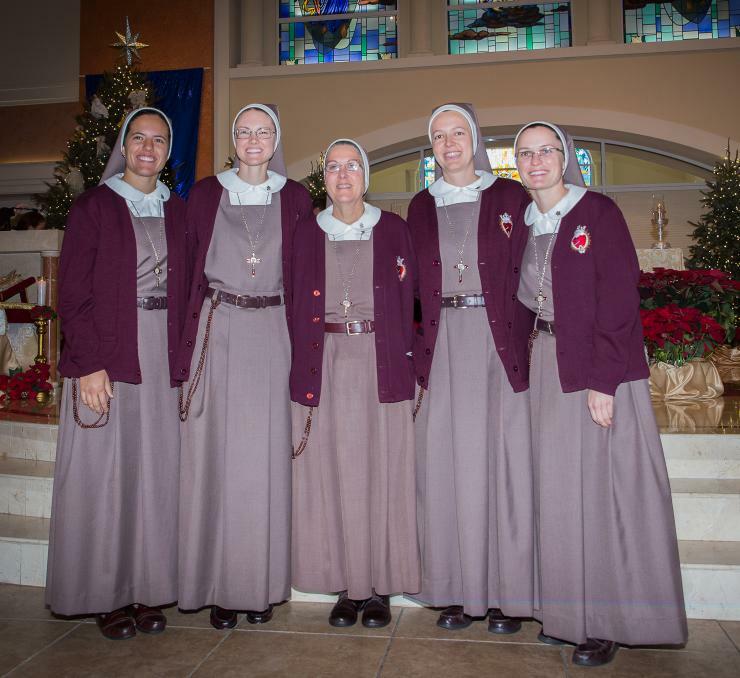 From left: Sister Alexia Maria Zaldivar-Boillat, Sister Brittany Rose Samuelson, Sister Mary Rachel Hart, and Sister Clare Marie Bailey. Sister Brittany’s proud father, Frank Samuelson, admitted his initial fatherly concerns but said he felt reassured after visiting her and experiencing the order’s love and ministry to the sick. The biggest challenge was limited communications with her during formation — only 15 minutes monthly in the third year. Nearby, Isman Martinez said he started attending the order’s prayer cenacles 19 years ago. Discovering his own call, he now completes diaconate formation and attends first Saturday Mass and adoration at the convent through their Apostles of the Pierced Hearts spiritual family. Hi, Matt You are indeed correct. Colleen was her baptismal name. She changed it to Clare when she entered the religious community.